I have a habit of getting stuck in ruts, we all know this by now. I try to get out of them, I really do — and one way I find can dislodge sticky wheels is by getting other people to suggest activities I wouldn’t ordinarily lean towards. 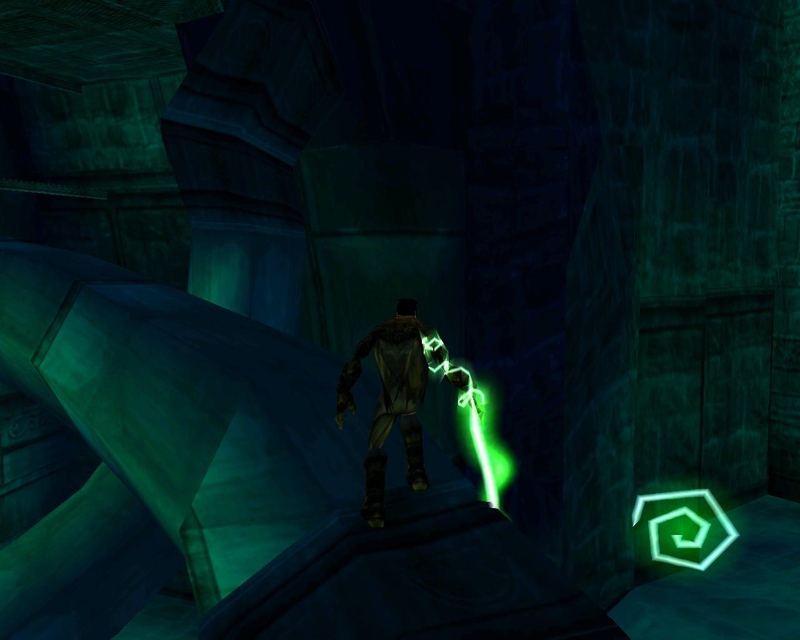 Today, Dionesiist recommends that I play Legacy of Kain: Soul Reaver. Third person post-apocalyptic fantasy vampire action! Bleak, that’s the word for it. The fiction is the distilled essence of grim and dark, but it’s actually kind of compelling. Not just straight up “vampires are awesome and so edgy!” nonsense, but some vague attempt to instill them with… well, a sensible origin and purpose — which in turn feeds the actual narrative. Vampires, this time around, are formed of a soul pulled back from the underworld and strapped to a dead body. They need to drink blood to sustain the corpse, while they get super-strength and magic shenanigans from being souls ripped out of the underworld. It’s a basic explanation, but it hand-waves in the right places. Needless to say, the vampires ended up taking over the world because, guess what, they are actually that much stronger than mortal humans. 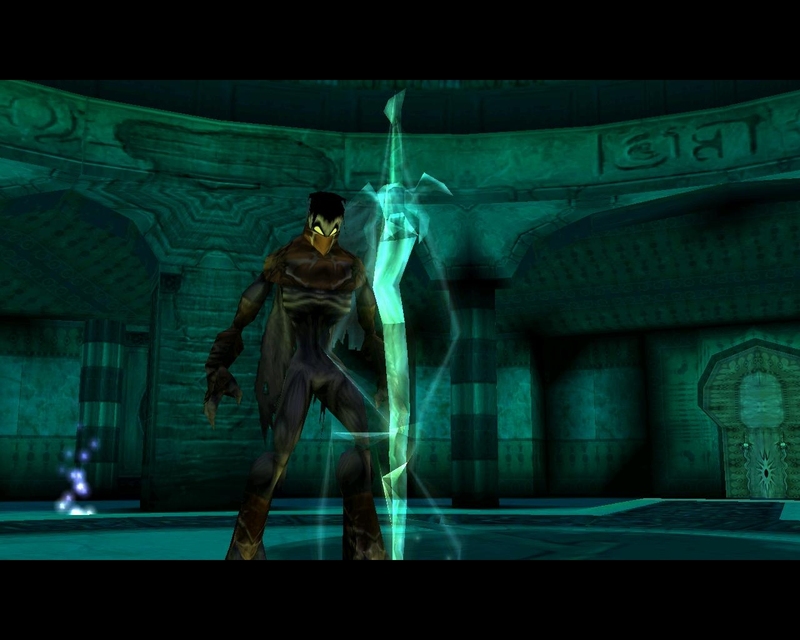 Basically, Soul Reaver makes arranging half-decent vampire fiction seem effortless. I mean, what would happen if powerful supernatural creatures existed? Why does most other vampire-based stuff just not bother trying to make vampires actually function in the ecosystem? Because they’re so dark you don’t need any more help to suspend your disbelief? I’d like a sword with you. Fast-forward a few thousand years and due to that vampiric disruption of the natural order, the world is kind of fucked. 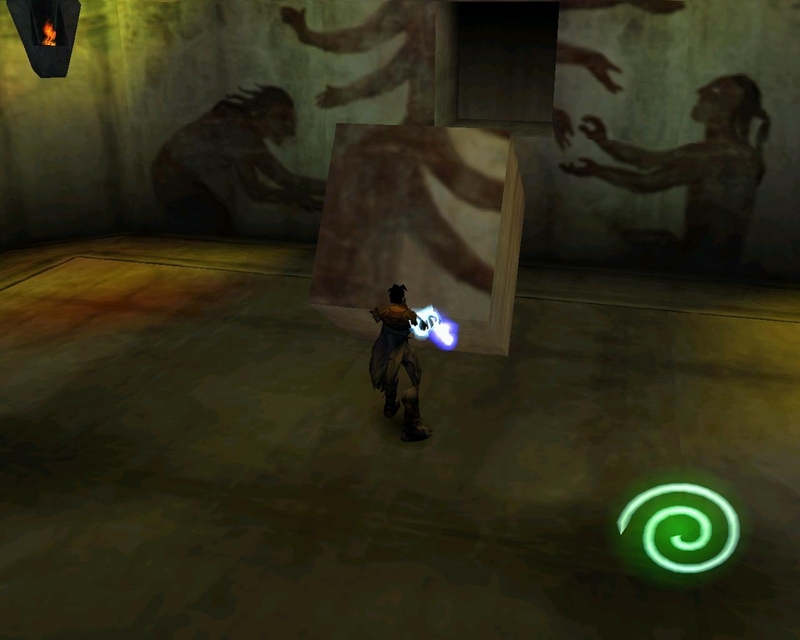 A hungry Elder God who hasn’t had any souls to eat since the vampires locked them all up in corpses on the surface resurrects you, Raziel, who got binned for being better than the titular Kain, and sends you off to solve environmental puzzles. Pleasing fiction aside, it is unfortunately pretty janky to play. While the long empty corridors that hide technological limitations of the time lend the game an eerie, lonely feeling that compounds the desolate post-apocalyptic world, the frequent box-shoving puzzles are all just obtuse enough to be irritating. Jumping challenges are present too, and in true Sonic Adventure style movement is relative to a camera that frequently has a mind of its own — making the jumps difficult for all the wrong reasons. It’s not even solvable with a gamepad this time. Even if the XBone Controller For PC worked (it has the same issue as SADX, actually, where the left stick is permanently registered to be pushing left) — it still only registers the four directions of movement you get from the cursor keys. Try keeping your feet on a twisting path when you can only move at 45-degree angles and the camera won’t hold steady. Even conceptually it’s a game that would benefit immensely from mouselook. The environments are gorgeous in that way that only ragged low-poly environments can be, making up for the lack of raw detail with overblown grandeur, but with the camera basically doing its own thing it’s very difficult to just look around. It’s not just a visual thing, it hurts the gameply too — it’s very often difficult to see those ledges that lies just above where the camera points, leading to frustration as you fear you’ve wandered into a dead end with nowhere to go. It’s even worse when you have to stack boxes to get to an even higher ledge you had no chance of seeing unless you already knew it was there or were very thorough, and this is exactly a situation that unfolds very early on in the game. Block puzzles are even better than usual because blocks can be rotated and even chucked up ledges. Come back Towers of Hanoi, all is forgiven! So, a puzzling platformer where platforming and puzzling are made frustrating by the control scheme — what about vampire-bashing combat? Alas, little better. Raziel will swipe the air in front of him but since you can’t manoeuvre very well there is an “auto-face” button — hold this down to keep pointing at one enemy. If there is more than one enemy around, it’s pretty much pot luck which one that’ll be. It’s another thing that undermines some vaguely interesting mechanics. Vampires cannot be killed just by punching them — you have to beat them until they stand stunned, then impale them, set fire to them or douse them in water. It’s clean enough when facing a single enemy, but in a group situation with two or three, the auto-face button might keep you punching the already senseless one while the others rake their claws through your back. Again, without more precise input, what could have been an interesting twist becomes an exercise in frustration. Forcing you to think during combat is one thing, but then making it difficult to act on those thoughts for all the wrong reasons is just bad. Every death entails a few dramatic seconds of the monster writhing in pain. So edgy! I’m torn. I want to love it, for what it is. It’s a grand, atmospheric adventure, but it’s so difficult to play, to interact with. It’s another game of which I’d want to see a remaster, not for upgraded graphics but for reworked controls that let you appreciate more of the world and not end up butting heads with imagined obstacles and constant frustrations. Though even I will concede that Melchiah probably has too few polygons and pixels to really sell… whatever his design is. 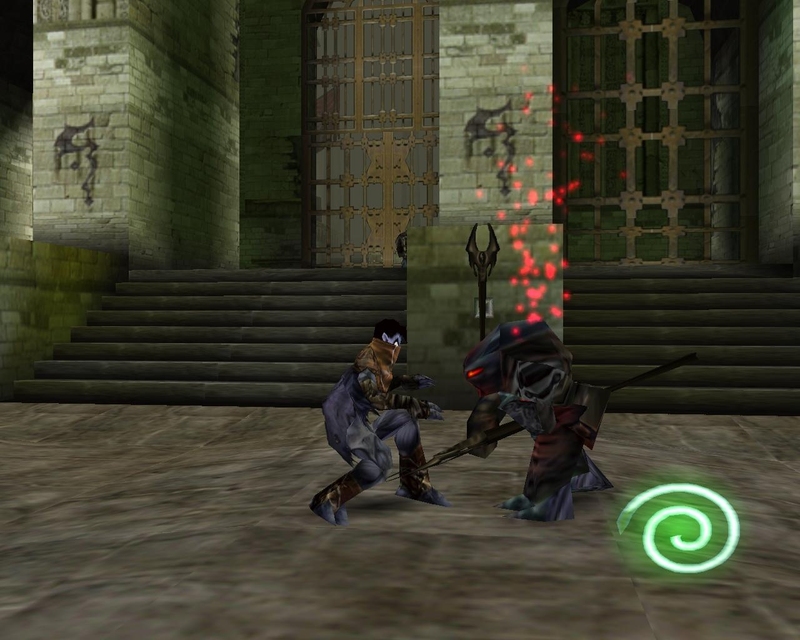 This entry was posted in Gaming and tagged Dio, late to the party, Legacy of Kain, Recommends, Soul Reaver by Rao Dao Zao. Bookmark the permalink.